After a decidedly poor set of results in our last look at corresponding fixtures to last season, Villa approached a set of fixtures that would define if they would slump knee-deep into a relegation battle or secure a mid-table berth. The postponement of a tricky away game at Manchester City certainly soften the line-up of games, although this was a team that was beginning to stutter with only four points out of their last available 15. 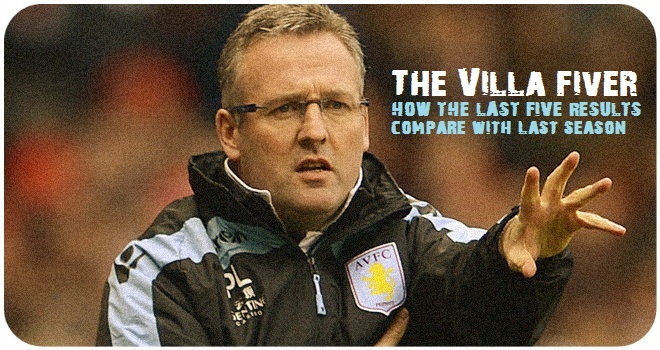 Despite a woeful result against Stoke in the last game and a decidingly poor start that should have seen at least three points instead of a single point from the first brace of games, Lambert’s men went along way to banish the Villa Park blues with two excellent home wins on the bounce. When Hoolahan put Norwich one-nil up the relegation alarm bells were ringing loudly, but then Villa scored six unanswered goals at Villa Park. While the last one didn’t count for anything, the others provided Villa with six very important points to set up a safe mid-table position to look down on the relegation struggle. A win or two is still needed, but at least there’s eight games left to finish off that task. At this stage of the season after 30 games, we can get a clear indication if Villa have made any improvement on last season. While the lazy option is compare our standing and points at the same stage of last season (as below), which would indicate a slight improvement of four points, against the same opponents we’re actually one point worse off. As we’ve mentioned elsewhere on MOMS, there hasn’t been a noticeable improvement. A more realistic way to look at it is it’s the same period of transition. But should Villa really be trending water for a season? You could argue that with the amount of new players in last summer, it would take more time to bed them in, but the reality is, very few of them have imposed themselves on the first team. Helenius, Tonev and Holt have mainly just made up the numbers in training, Luna has nose-dived, while Okore and Kozák have sat on the sidelines injured for most of the season. Only Bacuna has been a first team mainstay. Just to reach the same final tally of 41 points of last season, Villa would need seven points from the remaining eight games. It’s a bit like the last over and a bit of a one day cricket match, when Villa really should have surpassed that amount already for the season to be considered an improvement. Southampton currently on 45 points have improved by 14 points, from 31 pts. The biggest improvers are Liverpool, who are 20 points up on their tally after 30 games. The next five fixtures on the horizon though offer Villa a guilt-edge chance to register a proper statistical improvement on last season. After the United game, they surely must get more than last season’s three point haul against teams that they should have a chance of beating.